Thousands of girls and women gather to pray where the Tabernacle once stood. 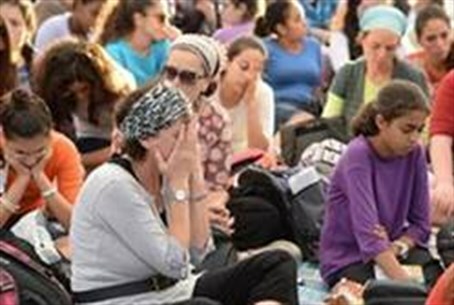 Three thousand women and girls made the journey Wednesday to the town of Shilo, in Samaria (Shomron) for a special group prayer recalling the biblical prayer of Hannah. Modern Shilo stands where the ancient city of Shilo once did. Ancient Shilo was, for 369 years, the location of the holy Tabernacle built by the Jewish people in the wilderness after leaving Egypt. While the Tabernacle was in Shilo, Jews from across the country would visit the area to make sacrifices. Hannah’s visit to the Tabernacle is recorded in the book of Samuel: Hannah came to pray for children, and the priest Eli mistakenly thought she was drunk, as her form of silent prayer was unfamiliar to him. When he realized his mistake he blessed her, and she went on to give birth to the prophet Samuel. Hannah’s silent prayer later became the basis for Jewish prayer: the central Amidah prayer, which is said three times a day, is said in a whisper. Wednesday night’s gathering began with a lesson in Torah from renowned speaker Yemima Mizrachi, who spoke about the uniqueness of the city of Shilo, the special nature of the time before Rosh Hashanah, and the special qualities of Hannah’s prayer. According to Jewish mysticism, Hannah’s prayer is particularly effective in removing external barriers to the fulfillment of prayers. The women then joined together in an emotional recitation of Hannah’s prayer. At the suggestion of Rabbi Shmuel Eliyahu, who spoke at the event, the women also took a minute to bless each other. The evening ended with an appearance by singer Eti Ankari. This was the third year that a special women’s gathering has been held in Shilo. Organizers noted that the number of women and girls in attendance has grown each year, and said they are already preparing for 5,000 to come next year.